Hi, I'm Mike your friendly Epicnpc admin. Please contact me for any help. Epicnpc does not provide off-site support. We will never contact you on any chat. Middleman transactions (Trade Guardian) are never conducted off-site or via email. I do not have Skype, Discord or any other chat program. An Epicnpc Admin will never contact you on chat. 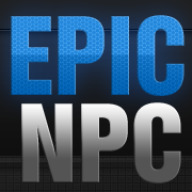 What I'm trying to say is that all services and support issues are conducted on Epicnpc.com only. Never off-site.